52’, directed by Jean-Pierre Carlon. 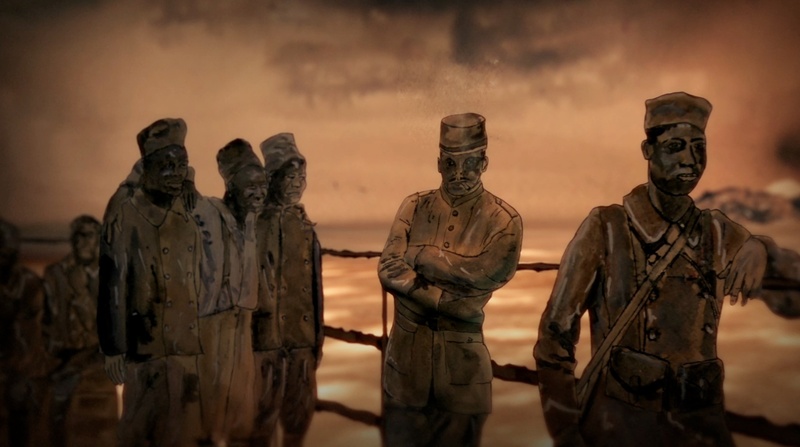 A film part of the collection « 14-18 beyond the war », coproduced by France Televisions. With the support of the CNC, the CNC New Technologies, the ACSÉ-Images of the diversity, the French Ministry of Defense, the PACA region, the Procirep, the Angoa, the City of Marseille and the “Mission du Centenaire 14-18” (The First Word War Centennial Commission). “Centenaire” label of the “Mission du Centenaire 14-18”. 1914, something is going to change: the “Other” is not anymore the fruit of our imagination… He is no more the one coming from far away places with wife and children depicted in colonial exhibits. Today he is here. He walks down our streets, we can talk to him, touch him, satisfy our curiosity, cheer him as our savior and why not, love him or hate him if needed. They come to save France from four corners of the world, by thousands, by millions. This sudden mix of population is no doubt becoming a strong influence on what molded the society we live in today. But, it allows as well those foreigners to know us better. Bakary Diallo is the only African “tirailleur” to have left a written account of this war. It is due, without a doubt, to Lucie Cousturier, a painter who taught French to Africans in the Frejus area. Illustrated by Sebastien Allart, their story, the one of ordinary people who have gone through these tragic events, rolls out with sensitive notes throughout the film. With the participation of Marc Michel, Emmanuelle Cronier, Jacques Frémeaux, Jean-Yves Le Naour, Li Ma and Jean-Pierre Turbergue.